Last week, in the wake of the UIL Track Championships, Ready to Run took you through a variety of speed/track workouts. And while track workouts are fantastic, there’s another way to build strength and speed (with an emphasis on strength), and it’s called “tempo” running. So what is tempo running? Really just another name for “lactate threshold” runs. OK, so what are those? Tempo runs develop mental concentration and toughness, improve your endurance, and enhance your ability to be comfortable running at race pace. 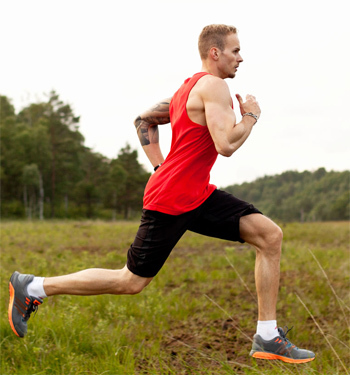 Tempo runs usually consist of four to six-mile workouts at just off of your race pace. These workouts help push back your lactate threshold—hence the alternate name. They do this by teaching your body to more quickly clear out the lactate buildup, and this delays the fatigue that sets in late in a race. But the benefits of tempo runs don’t stop there. They also (just like interval training) help increase your VO2Max (your body’s ability to take in oxygen and use it to make energy in muscles). But wait, there’s more! Practicing tempo runs regularly actually helps your body to build more capillaries in working muscles, and that means more oxygenated blood, which in turn, translates to faster running. The basic beginner tempo run starts with a one-mile warm-up followed by two miles at about 30 seconds per mile off your 5K pace, followed by a warm-down. The race-ready tempo run is great for longer distances, and calls for a one-mile warm-up, then four miles at about 20-seconds per mile off your 5K pace, followed by a warm-down. Did you know you can do tempo intervals? Like the other workouts, start and finish the run with a one-mile warm-up and cool-down. For the tempo part, try alternating between six-minutes fast and six-minute slow intervals. You’ll be running the fast intervals at 20 seconds slower than your 5K race pace. Alternate the fast and slow intervals for three to four miles before cooling down. Fast-finish tempo runs are great for learning how to run negative splits. And they are great for building the confidence to pick it up late in a race. Choose a seven-mile moderately hilly course. Set out by running the first three miles at a relatively easy pace. Beginning with the fourth mile, start to ramp it up, building speed mile by mile until you run the last mile at race pace. Tempo runs are a great addition to your training “arsenal.” They’ll develop mental concentration and toughness, improve your endurance, and enhance your ability to be comfortable running at race pace. Upcoming Races: Saturday, May 26, Deep in the Heart 5K at 8:00 a.m., Typhoon Texas Waterpark 18500 TX-130 Service Rd in Pflugerville. Monday. May 28 Lifetime CapTex Triathlon, 6:45 a.m., at Auditorium Shores, Austin. INTERNATIONAL COURSE: .93-mile swim | 24.3-mile bike | 6.2-mile run. SPRINT COURSE: .46-mile swim | 12.3-mile bike | 3.1-mile run. SUPER SPRINT COURSE:.25-mile swim | 6.3-mile bike | 3.1-mile run.